The ancestors of a Massachusetts tribe shared a Thanksgiving meal with the Pilgrims nearly 400 years ago. Now it is reclaiming its long-lost language. It is doing it one schoolchild at a time. "Weesowee mahkusunash," says teacher Siobhan Brown. She is using the Wampanoag phrase for "yellow shoes". She was reading to a preschool class from "Blue Hat, Green Hat,” a popular children's book. It was written by Sandra Boynton. The Mukayuhsak Weekuw is also called "Children's House." It is an immersion school launched by the Cape Cod-based Mashpee Wampanoag tribe. Their ancestors hosted a harvest celebration with the Pilgrims in 1621, helping to form the basis for the country's Thanksgiving tradition. 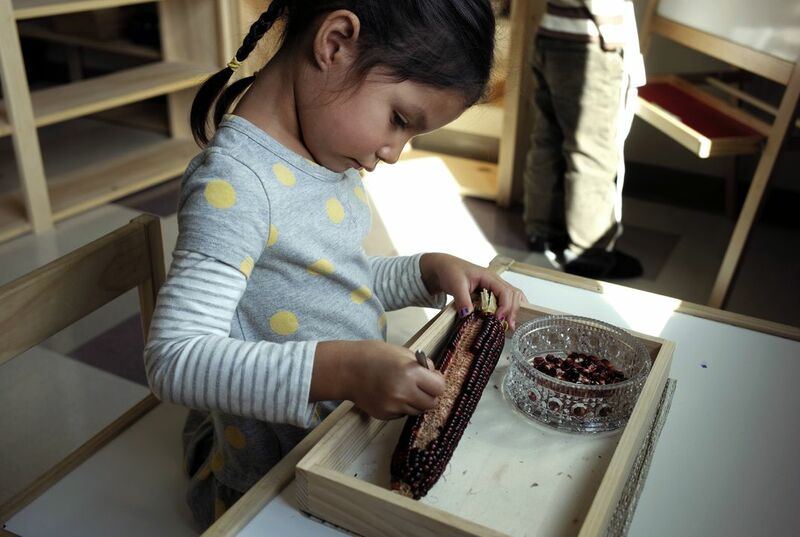 The 19 children from Wampanoag households that Brown and other teachers instruct are being taught exclusively in Wopanaotooaok. The language had not been spoken for at least a century, until the tribe started an effort to reclaim it more than two decades ago. The language brought to the English lexicon words like pumpkin (spelled pohpukun in Wopanaotooaok). It also delivered moccasin (mahkus), skunk (sukok), powwow (pawaw) and Massachusetts (masachoosut). But, like hundreds of other native tongues, it fell victim to the erosion of indigenous culture. That was the result of centuries of colonialism. "From having had no speakers for six generations to having 500 students attend some sort of class in the last 25 years? It's more than I could have ever expected in my lifetime." That's according to Jessie "Little Doe" Baird. She is the tribe's vice chairwoman. She is almost singularly responsible for the rebirth of the language. Tribal members refer to it simply as Wampanoag (pronounced WAHM'-puh-nawg). The immersion school is now in its second year. It is a key milestone in Baird's legacy. But it's not the only way the tribe is ensuring its language is never lost again. This year, seven students are enrolled in the district's first Wampanoag language class. The class, funded and staffed by the tribe, is held at the public high school. Volunteers host free language learning sessions for families each Friday at the Mashpee Wampanoag Indian Museum. "Sometimes it goes in one ear and out the other." That's according to Pauline Peters. She is 78 years old and lives in Hyannis. She has been attending the informal sessions for about three years. "It takes us elders a while to get things. The kids at the immersion school correct us all the time." The movement to revitalize native American languages started gaining traction in the 1990s. Today, most of country's more than 550 tribes are engaged in some form of language preservation work. That's according to Diana Cournoyer of the National Indian Education Association. But the Mashpee Wampanoag stand out because they're one of the few tribes to have brought back their language despite not having any surviving adult speakers, says Teresa McCarty. She is a cultural anthropologist and applied linguist at the University of California Los Angeles. Jessie Baird was in her 20s, had no college degree and zero training in linguistics. She had a dream that inspired her to start learning Wampanoag in the early 1990s. She and others drew on historical documents written in Wampanoag. 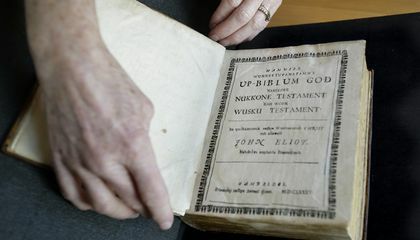 The documents included personal diaries of tribal members, Colonial-era land claims and a version of the King James Bible printed in 1663 that is considered one of the oldest ever printed in the Western hemisphere. To fill in the gaps,they turned to words, pronunciations and other auditory cues from related Algonquian languages still spoken today. Nearly three decades on, the tribe is still in need of more adults fluent in the language to continue expanding its immersion school and other youth-focused language efforts. These are the keys to ensuring the language's survival, says Jennifer Weston, director of the tribe's language department. A language can be lost because it may not be used a lot anymore or only used by the people who were related to those who spoke it. Languages that do die out still are acknowledged that they existed.